Health and Human Services Secretary Kathleen Sebelius on Wednesday offered the Obama administration's second formal apology to the American people for HealthCare.gov, the dysfunctional Obamacare website. Sebelius: "Hold me responsible" for HealthCare.gov "debacle"
"You deserve better, I aplogize," Sebelius said to the public in her opening remarks to the House Energy and Commerce Committee. "I'm accountable to you... I'm committed to earning your confidence back by fixing the site." The secretary acknowledged that since HealthCare.gov launched on Oct. 1, the experience of trying to sign up for a private insurance plan on the site has been "miserably frustrating" for many people. She assured the committee and the public that "we have a plan in place" to fix the site and reiterated the administration's promise to have it working for the vast majority of visitors by the end of November. Sebelius said that even though the site isn't "fully functioning," consumers are using it "every day" and they have "plenty of time" to sign up -- the open enrollment period lasts through the end of March. Rep. Marsha Blackburn, R-Tenn., asked Sebelius who is "responsible for this debacle," to which Sebelius replied, "Hold me accountable for the debacle. I'm responsible." Did President Obama break his health care promise? Sebelius at the top of the hearing strayed from her prepared opening statement, which offered no apology for the botched website rollout and blamed the problems on the private contractors who built the site. "To build the Marketplace, CMS [the Centers for Medicare & Medicaid Services] used private sector contractors, just as it does to administer aspects of Medicare," Sebelius' prepared testimony said. "CMS has a track record of successfully overseeing the many contractors our programs depend on to function. Unfortunately, a subset of those contracts for HealthCare.gov have not met expectations." The secretary told the committee Wednesday that the government has spent $118 million to build the website itself and $56 million in information technology support for the site. Asked whether the government is paying for botched work, Sebelius said, "We have obligated funds for a contract, [but] we certainly have not expended all those funds." Additionally, Sebelius said, "Paying for work that isn't complete is not something that we will do." One day prior to Sebelius' apology, Marilyn Tavenner, administrator for the Centers for Medicare & Medicaid Services (CMS), similarly apologized for HealthCare.gov's problems in a hearing of the House Ways and Means Committee. Meanwhile, President Obama was slated to defend his health care law in Boston on Wednesday afternoon. While HealthCare.gov has had siginficant problems in the past month, it's not the only element of the Affordable Care Act that's come under fire recently. In fact, even though Wednesday's hearing was intended to focus on the website, lawmakers on the committee first questioned Sebelius about the fact that millions of Americans are losing their insurance plans on the individiual market because they don't meet the minimum standards set by the Affordable Care Act. Committee Chairman Fred Upton, R-Mich., said it was unfair that those Americans are "now being forced to go on an inept website" to buy new insurance plans, "whether they like it or not." Blackburn made the case that some Americans may not want insurance plans that meet the new Obamacare standards, remarking, "Some people like to drive a Ford, not a Ferrari, and some like to drink from a red Solo cup, not one with a crystal stem." Rep. John Shimkus, R-Ill., pointed out that over the years, Mr. Obama has repeatedly promised consumers that once Obamacare went into effect, consumers who liked their insurance plans would be able to keep them. "Would you recommend to the president that he stop using that term?" Shimkus asked. Democrats on the committee, meanwhile, criticized their Republican colleagues for their continued attacks against the health law. Rep. Frank Pallone, D-N.J., called the issue of health insurers dropping certain insurance plans, "just another red herring." He pointed out that "this is not socialized medicine, this is private insurance in a competitive market," making the point that private insurers change their plans all the time to stay competitive. Rep. Eliot Engel, D-N.Y., said that Republicans were behaving like Chicken Little, except, he said, "my Republican colleagues are actually rooting for the sky to fall." Engel added, "I don't think, Madam Secretary, there is one person in this room who is naive enough to think the Republicans actually want this law to work." Getting back to the construction of HealthCare.gov, Sebelius said that the contractors who build the site never asked HHS or CMS to delay the site's launch. CMS administrator Tavenner made the decision in the weeks leading up to the site's launch to turn off its browsing feature. "We were anxious to get the website up and running and functional, which we celarly failed to do," she said. "They pared down some of the features feeling, it would be better to load them later." The private contractors who built HealthCare.gov told the Energy and Commerce Committee earlier this month that they only had a couple of weeks to test the site before its launch when months of testing would've been preferable. 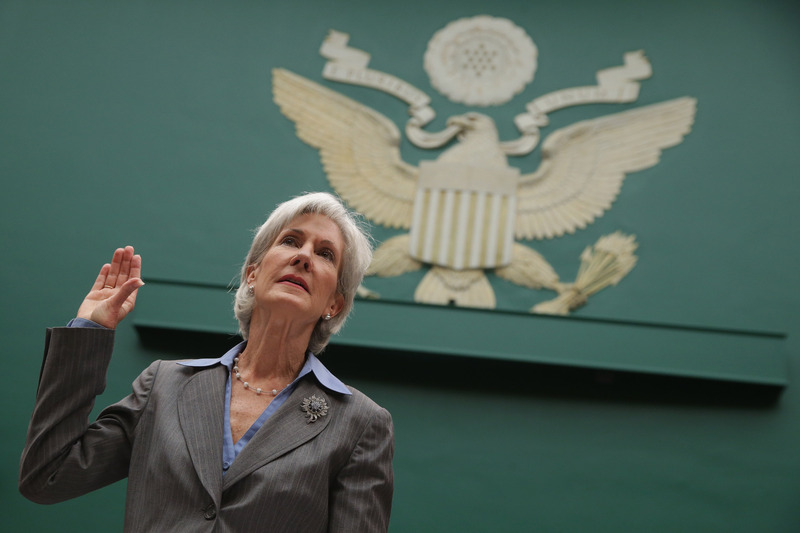 Sebelius acknowledged Wednesday that two weeks for testing was "clearly not" sufficient. Meanwhile, an internal CMS memo dated Sept. 27 -- four days before HealthCare.gov. went live -- indicates the government decided to go forward with launching the site even though there were "inherent security risks." It says the law requires that the federal marketplace systems successfully undergo a Security Control Assessment (SCA) but that "due to system readiness issues, the SCA was only partly completed. This constitutes a risk that must be accepted and mitigated to support the Marketplace Day 1 operations." Tavenner signed the authority for HealthCare.gov to operate for six months while a mitigation plan was implemented. The mitigation included establishing a dedicated security team, providing weekly progress reports and conducting a full security assessment within 60 to 90 days of going live. Rep. Mike Rogers, R-Mich., suggested in Wednesday's hearing that the personal data of Americans who sign up through the site is at risk. "You accepted a risk on behalf of every user of this computer that put their personal financial information at risk because you did not even have the most basic end-to-end test on security of this system," Rogers said. "Amazon would never do this, ProFlowers would never do this, Kayak would never do this. This is completely an unacceptable level of security."